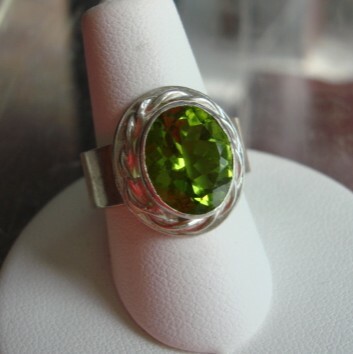 This vibrant green gem is formed as a result of volcanic activity. 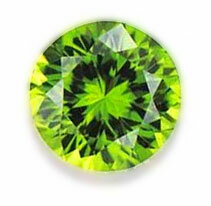 The name Peridot comes from the Arabic word "faridat," meaning gem. Peridot is a mineral named Olivine, which is found in a variety of greens, ranging from light yellowish green to a dark olive. Many years ago, natives discovered Peridot crystals in the black sands of Hawaii. Early Egyptian priests drank a brew called Soma from cups made of Peridot. They believed this drew them closer to Isis, the goddess of nature. And legend has it that Peridot glowed with light even as darkness fell, this is why miners were said to have looked for these gems during the night, marking their location, and returning in the light of day to retrieve them. Perhaps this legendary mining method is the reason that the Peridot is sometimes called "evening emerald." Nature is alive within a Peridot, making this gemstone a symbol of vitality. It signifies strength, both individual and within a relationship, as well as the promise of new growth in years ahead. 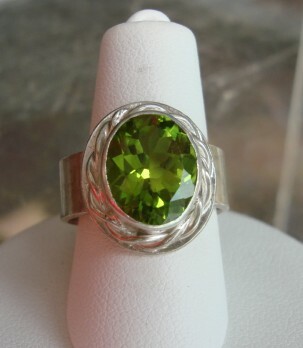 Come by the gallery and check out our Peridot ring in sterling silver!